It all started in 1972 when Phyllis Schlafly, who then lived in Alton, IL, decided to oppose the passage of the Equal Rights Amendment being pushed by the newly immerging feminist movement. This battle continued for the next 10 years until its final defeat. Phyllis organized groups all across the nation. She recruited Eunie Smith and Olive Spann to be co-chairs of Stop ERA in Alabama. In 1975 Phyllis realized that even after ERA was defeated, the battle for conservative family values would go on as the left would not give up, but would work to achieve their goals on an incremental basis. So even before ERA was defeated, she started the organization of grassroots activists called Eagle Forum. Eunie Smith continued as the leader of STOP ERA Alabama. She and others traveled all across Alabama, often with Phyllis, to speak the truth about ERA and what it would mean to our society if it were passed. They spoke to any group that would listen and explained how it would affect women, families, the military and every aspect of American life. 1977 was declared as the Year of the Woman and it was this year that feminist activists thought would be the victory year for ERA. A convention of delegates to promote this was held in Dallas and was promoted by the Carter Administration. The ERA would have enshrined in the Constitution changes that, rather than empower women, would have removed all legal protections for them. It would have required the draft of women to serve in the military, controlled many other aspects of family life and womanhood, especially rejecting the value of the stay at home mother as the center of family life. The convention in Dallas was a hotbed of radical feminists and the rhetoric worked to encourage delegates to push for passage of the ERA. However, not all state delegations were so inclined. Activists in each state met to choose delegates to the Dallas convention. Jean Saunders was the first president of Eagle Forum of Alabama, then Frances Wideman. Eunie Smith was still co-chair of Stop ERA. She became president at the end of the Stop ERA Campaign and has served since that time. of the family. Its original founding document states the goal is “..to advance the status of women, to defend their existing civil, legal, economic, moral and social rights, especially those pertaining to the family, marriage, children, education, and employment.” Of course, today the organization includes many man as well as women and teens, through our Teen Eagle organization. Eagle Forum (501c4) is the lobbying arm of the organization and works to protect Alabama’s families in public policy initiatives and reform efforts. 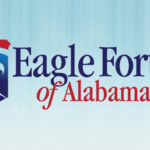 Eagle Forum of Alabama is the state’s leading grass roots Conservative organization addressing issues from parental rights to economic liberty because they all impact the family. We believe strong families are the foundation of prosperity in Alabama and the nation.